Although the blue sky cases gave states the power to regulate securities, they ultimately had limited effect on interstate securities practices. National events would soon change that. When the stock market crashed in October 1929, no one anticipated the breadth or depth of the Depression. During President Hoover’s administration, the stock market lost 89% of its value. 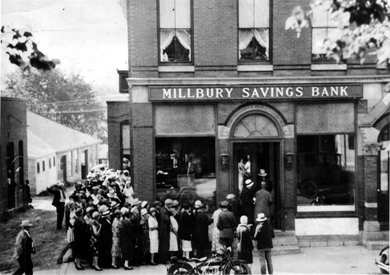 From 1929 to 1933, nearly 9,000 banks failed and almost one in four of all workers were unemployed. Tens of thousands of businesses closed and the country experienced immense financial ruin. States responded to the crisis by passing new statutes and creating agencies to reform the sale of securities. The New York Stock Exchange and the IBA, arguing that self-regulation of the securities industry was sufficient to remedy the problems, faced heavy criticism because self-regulation was considered ineffective to address the widening economic ruin. What became evident was that the rapid change in the securities industry, including new forms of common and preferred stock, the advent of investment trusts and holding companies, and the power of the central stock exchanges, had fundamentally altered the securities and investment banking industry on a national level; that those changes had gone mostly unregulated, creating the conditions for economic collapse; and that these changes now demanded a national response. (20) H. W. Brands, Traitor to His Class (Doubleday: New York, 2008), 210-211. (21) Parrish, 1-120; Richard A. Maidment, The Judicial Response to the New Deal (Manchester University Press: Manchester, 1992), 13-81; Burt Solomon, FDR v. The Constitution (Walker and Co: New York, 2008), 27-83; Stephen K. Shaw, William D. Pederson, and Frank J. Williams, Franklin D. Roosevelt and the Transformation of the Supreme Court (M.E. Sharpe: New York, 2003); Michael Conant, The Constitution and Economic Regulation (Transaction Publishers: New Brunswick, 2008), 83-137; William E. Leuchtenburg, The Supreme Court Reborn, (Oxford University Press: New York, 1996), 164-236; Mannino, 100.